Below: After much deliberation I have decided to offer this knife for sale in an attempt to raise money for a couple others. It is a very unique knife. I suspect it was made by someone at the Darlington Locomotive Works England for a fellow employee going off to war. 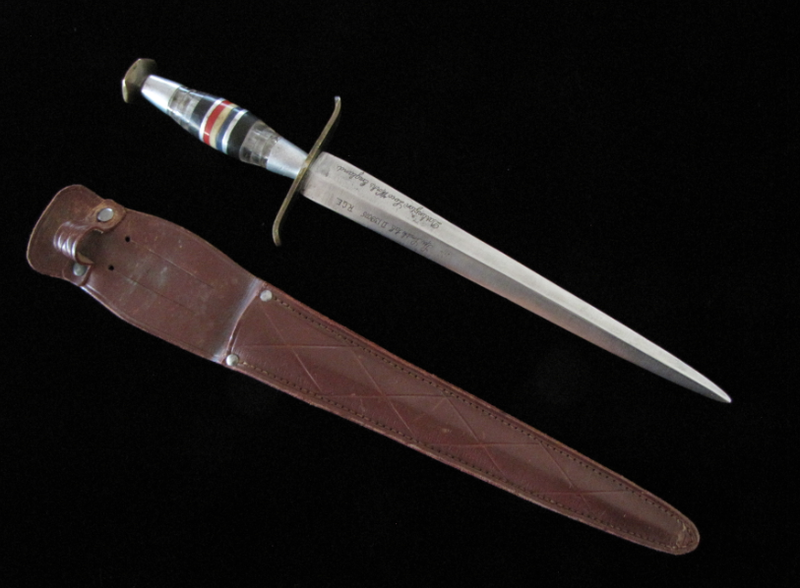 It provides an excellent opportunity for someone to purchase a custom WW-II dagger with clear provenance and a chance to do further research. The handle is made of plexiglas and aluminum washers. I was told by a Scottish arms maker the colored rings designate an Artillery Unit. More photos on request. SALE PRICE shipped CONUS is $825 $750. Ek model M-4 with micarta handle scales. Double edged blade etched and infilled with gold in commemoration of the US Army Special Forces. My camera seems to have trouble focusing on the etching?? The back side of the blade was professionally engraved to Sgt. R.W. Rose, MACV SOG. The blade has a few small scratches from careless sharpening on one bevel. Otherwise this knife is mint in its original green webbing sheath. A real beauty. SALE Price CONUS is $255 + $10 shipping. Below: Mint condition Effingham, IL. EK Commando knife. This is the model W-4 with walnut grips, double-edged blade and crossguard. These older Ek models are selling at higher prices since they went out of production and the new KaBar versions are less desirable. They don't come any cleaner or nicer than this one. Price for this one in its original sheath, mint condition is: $250 + $10 shipping CONUS. Elegant Peter Parkinson F-S Daggers for Sale. All knives plus shipping to US TBD. Paypal OK. These are THE finest Fairbairn Sykes knives made today! Blackened X-Dagger with 3 inch guard: $540 plus shipping from New Zealand. X Dagger blade length 188mm. An original like this would cost you $2,500-3,000 dollars. NOTE: Sometimes I will place a knife "on hold" for a client until they can get together the payment. This is a short term situation unless you are a previous buyer. Do NOT abuse this courtesy. I appreciate notice as soon as possible if you cannot afford to complete the purchase. So you may find some knives temporarily on hold but keep checking back in case they are released again for sale! Knife No. 22: Probably sold by a Military Tailor as well. Silver plated cutlery hilt has a nice age darkened patina. Knife is Tight. Oval blued guard is unmarked. Six and ½ inch heavy forged blade is full length and Peacock blued, heat treat finish! Sheath is formed brown leather stitched, with a belt loop in perfect condition. This is one beautiful knife! Price is $450. Many Thanks to Jay who bought 11 knives from me using the 5% discount! Here is an example of the knives I have for sale. 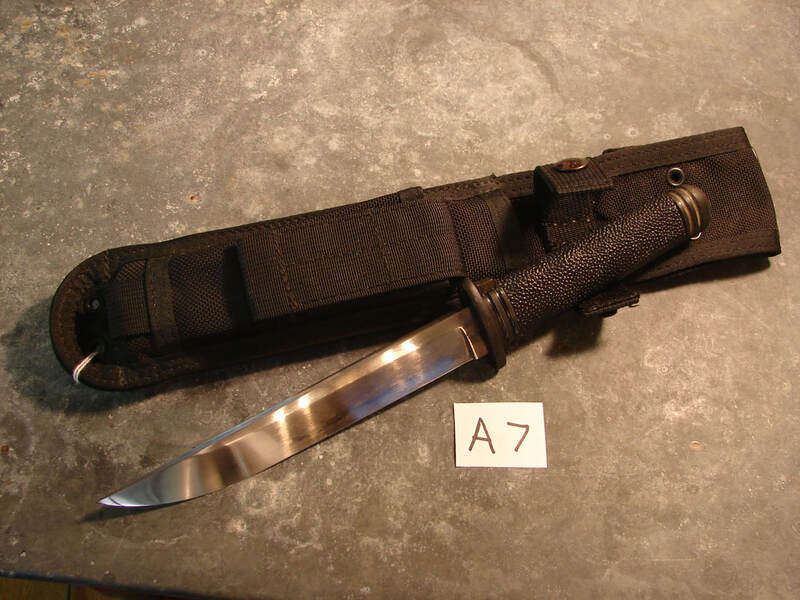 It is an early tactical Tanto from Hanwei Forge with an Eagle sheath. Carbon steel blade with real clay tempered hamon. Click the Button to go see the rest. I have a ton more knives still to add! !